Here at Away With It, we have been providing waste removal and rubbish clearance services to the people and businesses of Gidea Park RM2 for years. Over that time, we have built up a reputation for our solid, trustworthy and professional service, and also our commitment to affordability. We offer a full range of waste removal services, and can cater for everything from single room clearances right up to large-scale commercial waste collection – and of course everything in between! Our entire Gidea Park RM2 operation is customer focused, and as we are aware waste removal can be stressful at the best of times, our aim is to make it as easy and stress-free as possible. We operate our same-day service in 2-hour slots, 7 days a week. We are open from 7am-11:30pm, which enables us to operate around even the busiest of schedules. As we are fully regulated and licensed, you can have complete peace of mind in the knowledge that all your waste will be properly disposed of. We reuse or recycle 80% of all the waste we collect – waste removal can be ethical! Before we arrive, we will give you a comprehensive, no-obligation estimate. You only pay for the space in our vehicles you actually fill, so no matter how big or small the job you will be guaranteed a fair price. We are fully insured in the unlikely event of an accident on site, and we are committed to doing 100% of all the hard work and heavy lifting for you. We’ll even have a good cleanup before we leave! Speak to Away With It today about our fast, reliable and cost-effective waste removal services in Gidea Park RM2! Gidea Park, situated in the London Borough of Havering, first appeared in 1910-1911 as Romford Garden Suburb, which existed as an exhibition in town planning. A collection of houses and cottages were designed by a collection of reputable architects, along with a new railway station in a scheme headed by MPs Herbert Raphael, John Tudor Walters and Charles McCurdy. 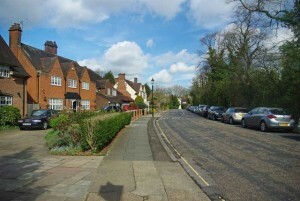 This initial Garden Suburb, influenced by similar schemes in areas such as Hampstead, soon evolved into what is now Gidea Park, a popular area of relative affluence. Six of the original houses in the scheme are now Grade II listed, and the area itself retains a feeling of art deco class. Gidea Park is home of the Royal Liberty School, which was the first school in Britain and one of the first in Europe to install an electronic computer, in 1965. The school boasts a number of notable alumni, including author and illustrator Mick Inkpen, BBC journalist Jeff Randall and musician and rhythm and blues pioneer Graham Bond. http://www.rosindell.com/ – Andrew Rosindell, your local Member of Parliament. http://www.romfordrecorder.co.uk/home – Local newspaper, covering news and current affairs for Gidea Park and the surrounding area.